How does the current Ballard Seattle real estate market compare to the 2007 bubble market? Around 10 years ago in 2007, the US real estate market began to implode and dragged Seattle along with it. The Seattle market was one of the last major cities to be affected and one of the first to emerge from the bottom of the market in 2012. Today, the Ballard and Seattle real estate markets are booming, with Seattle consistently being at, or near, the top of US cities for home price increases. Ballard Seattle is a sought after neighborhood by many home buyers. Ballard has it all! Just like all Seattle neighborhoods, Ballard Seattle homes for sale are attracting multiple offers and about 50% of Ballard homes selling for above list price. 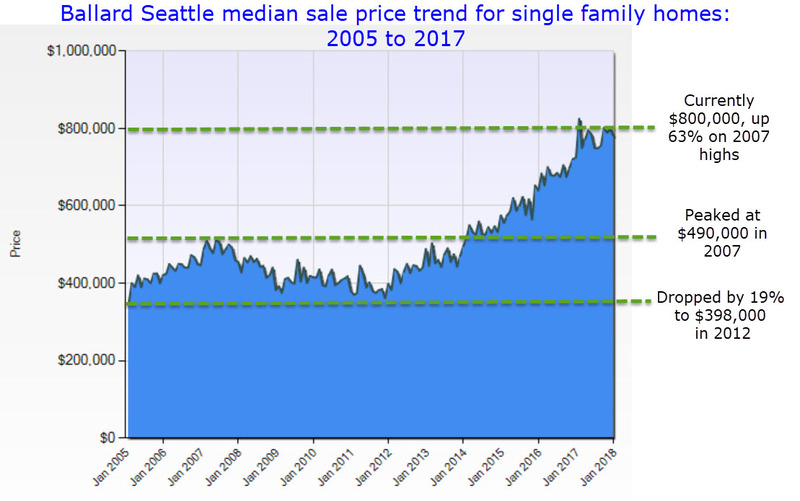 So how does Ballard Seattle real estate in 2018 compare to the last price surge in 2007? I looked at the following real estate statistics for between 2005 and 2017. Number of months of inventory. Ratio of the sale price to the list price. The number of homes for sale compared to the number of sold homes. All data was taken from the North West Multiple Listing Service (NWMLS). Note that MLS data only goes back to 2005, no data is available for the years prior to that. Ballard Seattle homes for sale price trend. The graph below shows how the Ballard real estate market peaked in 2007 with a median sale price of $490,000 and subsequently dropped by 19% to $398,000 by early 2012. Virtual staging: Penny Wise, Pound Foolish. People always overdo the matter when they attempt deception. Charles Dudley Warner. Virtual staging and (real) home staging are similar but only in that they share the word "staging". With improvements in virtual staging software, virtual staging has become a cheap “alternative” to hiring a professional company when staging a home. Staging a home for sale: should you use virtual staging? There are obvious pros and cons for each of these two options, the biggest one being cost. 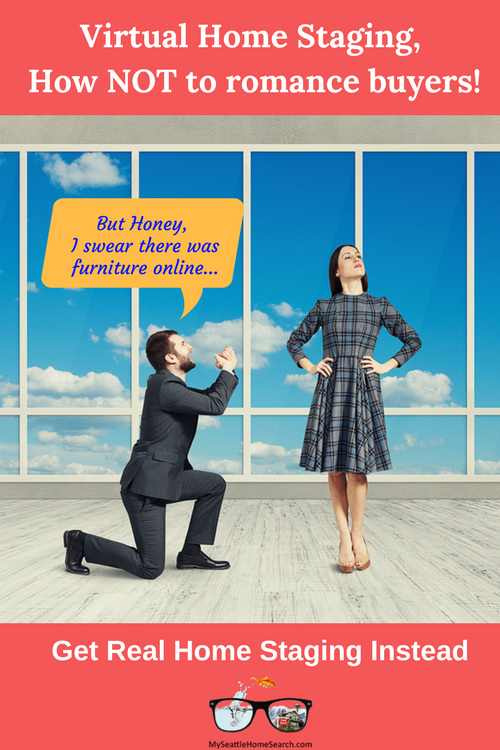 However, just because virtual home staging costs a lot less does not necessarily make it a good idea. It can be a case of being penny wise, pound foolish. For the purposes of comparing virtual staging and hiring a professional staging company, I will be comparing the staging of vacant homes where the sellers haveto move out and the home is completely empty. In general terms, home staging means getting your home ready for market and making it look it’s absolute best….both the interior and exterior. Home staging includes doing all the nitty-gritty stuff like cleaning the home so it’s Q-tip clean, decluttering, doing any needed repairs, landscaping, painting and taking care of curb appeal... and the actual staging with furniture and accessories.